Salix fargesii buds by PlantImageLibrary / Flickr. This very attractive willow was “discovered” by Isaac Henry Burkill in 1899 and introduced to the west from central China in 1910 by E.H. Wilson. In 1908 Wilson collected his specimens in the woodlands near Fang Hsien at an altitude of 6000 feet. Salix fargesii is also known to grow in the provinces of Sichuan, Hubei, Shaanxi and Gansu. Of the approximately 520 species of willow growing in China, 189 of which are endemic (growing only in China), Salix fargesii is often described as the most handsome. This wide-spreading, dwarf willow shoots decidedly non-willowy stout stems in the spring, beginning as a simple red and the next winter developing into a beautiful, burnished mahogany display. The stunning stems are complimented by the large, shining, bright red buds. Left: Salix fargesii at RHS Garden Wisley, by Flickr user Leonora Ening. 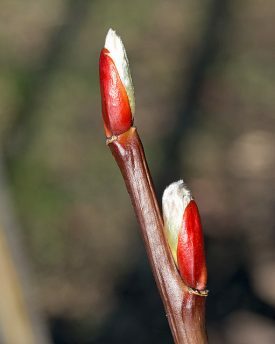 Right: Close-up of S. fargesii twig in the Washington Park Arboretum, by Roy Farrow. The 18 cm leaves, often described as “magnolia-like”, begin in the spring a rich red, maintaining some pink blush into summer before the leaves turn completely to an excellent, deep green. 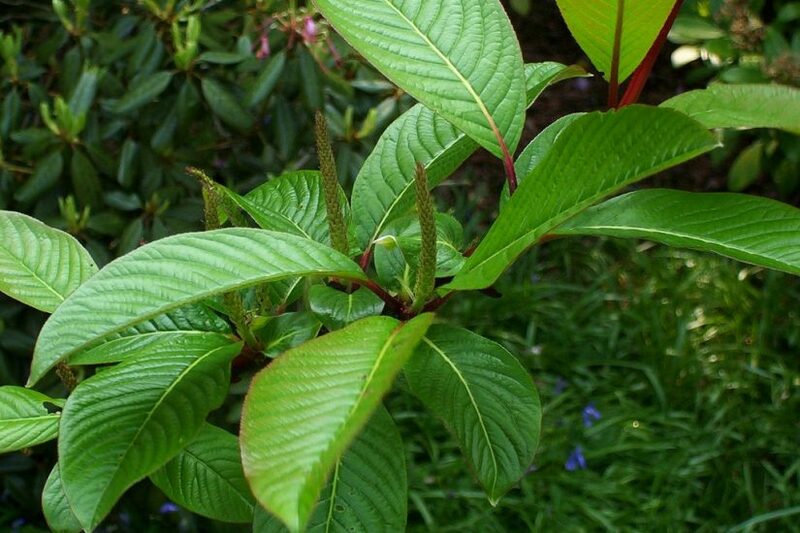 The leaves are glossy green on top, lighter green below with a deeply impressed venation. Upright catkins, up to 12 cm for male plants and 18 cm for female plants, appear in spring. Salix fargesii branch with leaves and developing catkins. Photo by Flickr user peganum. Though quite exceptionally singular in appearance, Salix fargesii remains a willow and like most willows grows best in moist, well-drained soil in full sun. This shrub will reach 10-12 feet in height and width so it requires space around it in which to spread. Farges willow has been reported to be hardy to zone 6. You can visit a Salix fargesii in the Joseph A. Witt Winter Garden in the Washington Park Arboretum (SW corner of bed H). Farges willow was named after Paul Farges (1844-1912) a French Jesuit missionary in Sichuan who was also an avid plant collector. In 1897 Paul Farges brought back the first seeds of the dove tree, Davidia involucrata. Many other species bear his name such as Abies fargesii, Catalpa fargesii, Decaisnea fargesii, Ilex fargesii and the bamboo genus Fargesia.